This off-trail cross country alpine helihike for the more adventurous client offers spectacular views of the top of the South Island only 9 minutes by helicopter from Nelson City. The Mount Richmond Forest Park is a rugged, mountainous, mainly forest clad park sitting between the Nelson and Marlborough regions. While it is literally on Nelsons back doorstep, it is relatively undiscovered by visitors, and infrequently visited by experienced trampers, due to its rugged nature and challenging access to its interior. 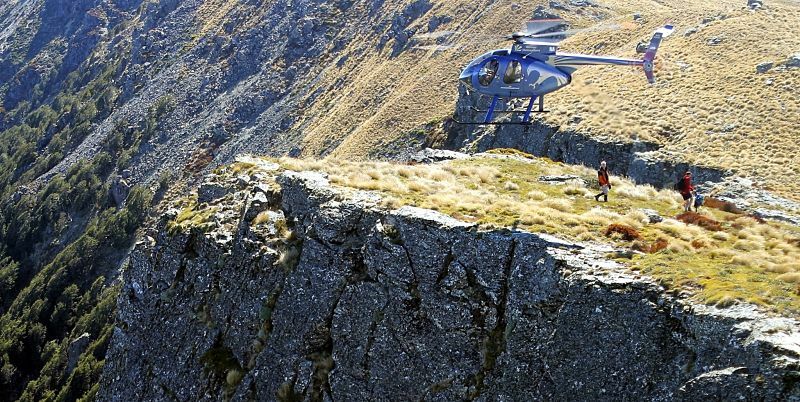 We access the hike on a relatively short (9 minute) helicopter flight from Nelson Airport. 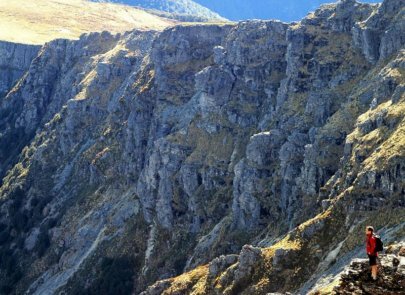 The hike itself is a non-technical but challenging 2 – 3 hour hike over uneven ground (no track) along a dramatic mountain ridge at 1600 metres (5,250 ft) in the park. The landing alone on a rocky ridge down from the summit is breathtaking, with the sudden silence and dramatic views when the helicopter moves away after dropping guide and clients, impressing the hiker. The helicopter stays on the mountain to wait at the other end of the hike. The trip provides stunning views of the top of the South Island across the Marlborough Sounds to the North Island, Kaikoura, Marlborough, and Nelson and Tasman Bay. The hike, after we leave the helicopter on the western ridge of Mount Richmond, begins with a short ascent up a broad rocky ridge to the peak, from which stunning 360o views can be seen south to Kaikoura, north to Wellington and D’Urville Island, and west to the Kahurangi and Abel Tasman National Parks. Descending from Mount Richmond down a slope of loose shale to a wide grassy saddle, we briefly ascend again before following a spectacular irregular ridge with a sheer 300 metre (1000ft) drop on one side, and gentle alpine tussock grasslands on the other. This is an “away from it all” experience, less than 10 minutes from Nelson. When we first researched the trip, we thought it might be nice to have a helitrek close to Nelson City. We were unprepared for the spectacular nature of it. This trip suits clients who seek a true New Zealand alpine experience, and are happy walking over loose rock and through high tussocks. It is non technical and while the views and drop offs are spectacular, clients are not exposed to steep faces during the hike. It requires agility over uneven ground rather than a high level of fitness. The short climbs are moderate in steepness and can be taken slowly. This is typical New Zealand back country, with loose rock and big tussocks which make moving across the ground awkward at times. While it is possible to stand on the edge of the 300 metre escarpment at the end of the hike, the route itself is not exposed at any point. What happens if the weather changes quickly? After dropping us below the peak, the helicopter moves across to the end of the hike. In the event of a sudden weather change, the helicopter can be with us in a few minutes. 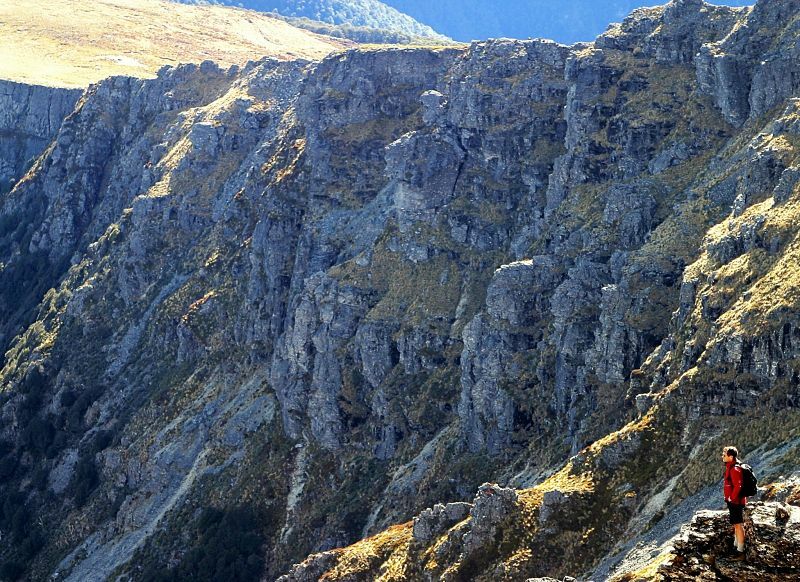 There is a mountain hut within easy reach of the hike. This is an alpine trip and the weather can change quickly in New Zealand. You should have a polypropylene or wool undergarment next to your skin, shirt, and a warm fleece or wool pullover, plus a windproof jacket. Most New Zealanders wear shorts, preferably of the quick drying type, although travel type trousers are fine. Avoid cotton garments if possible. We can usually supply this type of clothing if required. Trainers or running shoes are adequate for this trip, light hiking shoes or boots are better. A day pack and water bottle are useful (we can also supply these).